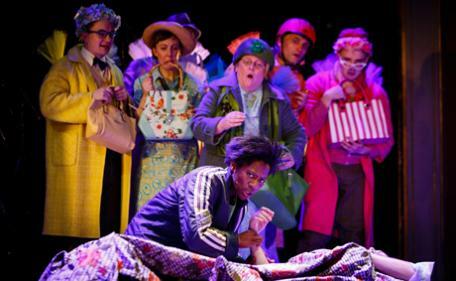 Sleeping Beauty Review - The Old Vic - SYS THEATRE. Sally Cookson’s production of Sleeping Beauty at the Bristol Old Vic intertwines the story of ‘Sleeping Beauty’ with traditional Welsh Folk Tale ‘The Leaves that Hung but Never Grew’, offering a fresh perspective on life after ‘the kiss’. Cookson has chosen to reverse the gender roles of Sleeping Beauty (now Prince Percy) and the Prince (now Deilen), creating a refreshing opportunity for our female lead to be pro-active in this fairy tale. The story begins with a distraught Prince Percy (played with vibrant, naïve enthusiasm by David Emmings), his kingdom and parents desperately unable to soothe his sorrow. He is approached by his heroine, Deilen (a direct and empowered performance by Kezrena James), who hands him his journal detailing his entire life from birth to the present. Cursed to prick his finger and fall asleep on his sixteenth birthday until the kiss of true love awakens him, Percy and all his human kingdom succumb to a 100-year slumber. Fortunately, whilst on her quest to discover the leaves that hang, but never grew, Deilen discovers his body and administers CPR to what appears to be a casualty. Thus, awakening our prince. Elated by the prospect of leaving the palace for the first time, Percy joins Deilen on her adventure where they embark upon their slow-burning, but inevitable relationship. A magnificent trio of musicians (Ruth Hammond, Brian Hargreaves and Pat Moran) carry the tone of the performance with a textured and enveloping score, including some wonderful musical numbers sung (expertly) by the ensemble - ranging from lively rock-n-roll to hauntingly sombre elegies. The Fairy Godmothers are a tribe of wonderfully comical Women’s Institute members. Their choice to exclude the black sheep of the circle, Sylvia (chillingly played by Stu Goodwin), from Percy’s first birthday celebration results in the familiar, outraged curse. But what strikes me with this production, is that amongst the hilarity of their performance, the Godmothers are rather passive in the path of Percy’s fate. With the exception of reducing Sylvia’s curse from a death sentence to one with a chance of salvation, they do nothing more to help their Prince awaken from his spell. They simply sit and wait, producing tapestry for a hundred years. Never giving up hope, but never actively fighting for him. The choice to switch the genders of the prince and princess appears to be more about exploration than academic interrogation. A welcome statement for our young audience members allowing the female character a chance to serve a purpose greater than marrying a prince. However, it feels curious to me that within fairy tales we often see the female lead’s fate turn around at the hands of a rich man who will provide for her eternally. Yet, when our lead is a man (as is the case in this story), it matters not that his heroine is penniless. An uneven dynamic that I would have enjoyed to see put to question. However, I must discern the fact that Cookson’s production was first and foremost created as an enjoyable Christmas show for young people not a platform from which to cross-examine gender (in)equality. A refreshing idea here is that the heroine gains a dimension of her own – a back story. The chance to become much more than a dimensionless saviour, offering her ‘man’ much more than the façade of wealth and good fortune. However, Deilen’s heart-breaking story feels ill-placed and poses a structural issue within this performance, interrupting an otherwise fluid journey. This is an exciting, expertly produced production of stellar quality for young audiences and grown-ups alike (it’s the adults who laugh the hardest). A performance which refuses to speak down to the young that will possibly appeal more to the older siblings of fairy tale enthused children than the little ones themselves.